Weight training equipment can be costly and cumbersome -- Thera Band straps will easily solve both of those problems! 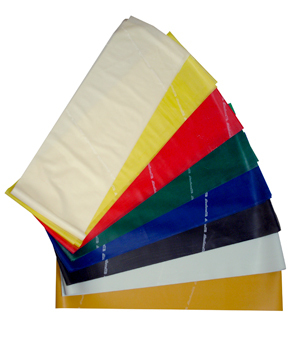 Five foot Thera-Bands are the number one choice of physical therapists nationwide. They are color-coded for progressive resistance so you can add or decrease resistance in measured increments. Price increases with increased resistance. Proper use of these Resistance Bands for resistive exercise provides both positive and negative force on the muscles, improving strength, range of motion and cooperation of muscle groups. Color-coded progressive resistance gives at-a-glance documentation of progress from one level to the next. Thera Band Resistive Exercise Bands cost much less than other exercise equipment sold with claims of achieving similar results, plus they are portable and versatile with virtually unlimited uses. Recognized and used throughout the world, they are endorsed by the American Physical Therapy Association (APTA). With Thera Band Latex Band Systems, measuring progress and achieving goals for fitness or therapy is easier than ever before. Different resistance levels are determined by thickness of the band. Thank you so much for the chart that explains the resistance strength of each band. Because of this I was able to order the band at just the right resistance. Purchased the silver band. Great quality and price. The 5 ft thera band in blue was just what I needed after the ones I had gotten in therapy had broken. They are good quality and I will definitely order more from Yoga Direct when I need them. Great Item. Great Quality. I use this band with athletes and its great for their resistance training.